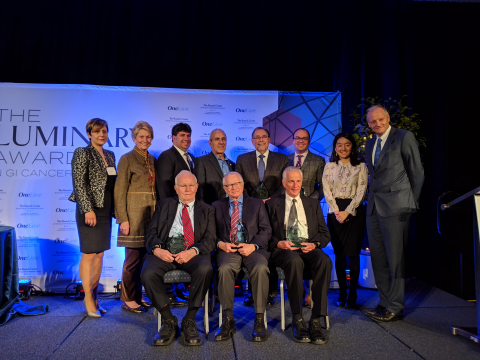 CRANBURY, N.J.--(BUSINESS WIRE)--OncLive® and The Ruesch Center for the Cure of Gastrointestinal Cancers, the founding partners of the Luminary Awards in GI Cancers, congratulate the 2018 honorees recognized at the Second Annual Luminary Awards ceremony, which was held Thursday, Nov. 29, at the Washington Hilton in Washington, D.C.
“We are so proud to honor these individuals who have made both a fundamental and dramatic impact on the lives of so many patients with GI cancers. While not one of these individuals seeks the spotlight, we feel it is very important to acknowledge their lifetime contributions and their dedication to others. This event is by far the Ruesch Center's most joyous occasion,” said John L. Marshall, M.D., director of The Ruesch Center for the Cure of Gastrointestinal Cancers. John S. Macdonald, M.D., FACP; Criterium Inc.
Macdonald is the senior medical advisor for Criterium Inc. He served as the medical director and the chief of gastrointestinal oncology at St. Vincent’s Comprehensive Cancer Center in New York City, chief of medical oncology at St. Vincent’s Hospital and Medical Center and a professor of medicine at New York Medical College from 1998 to 2007. Macdonald has received numerous awards and distinctions, including recognition as one of Good Housekeeping’s Best 300 Doctors in America and, over a seven-year period, New York’s Best Doctors in New York. He has written more than 400 articles, abstracts and book chapters. After losing his mother to colon cancer in May 2009, Sapienza turned his grief into action, inspiring and challenging the colorectal cancer community and his family, friends, and professional associates to follow his lead and dedicate themselves to the Colon Cancer Alliance mission. After founding the Chris4Life Colon Cancer Foundation and serving as its president from 2010 to 2015, he led the effort to merge the alliance and the foundation, creating the nation’s largest nonprofit specific to colon cancer. Currently, he is the CEO of the Colorectal Cancer Alliance and a member of The Ruesch Center for the Cure of Gastrointestinal Cancer’s advisory board. A highly respected leader in the field of oncology, Schilsky is the senior vice president and the chief medical officer of ASCO, as well as a past president. Previously, he served as the chief of hematology and oncology in the department of medicine and the deputy director of the University of Chicago Medicine Comprehensive Cancer Center. He specializes in new drug development and treatment of gastrointestinal cancers. His impressive experience and proven track record in both clinical medicine and clinical research reflect his deep passion for cancer medicine. Schilsky has spent most of his career at the University of Chicago, where he joined the faculty in 1984, rising to the rank of professor of medicine and serving in many roles, including associate dean for clinical research in the biological sciences division and director of the cancer center. Earlier in his career, he worked in the clinical pharmacology branch of the division of cancer treatment at the National Cancer Institute and was an assistant professor in the department of internal medicine, division of hematology and oncology, at the University of Missouri-Columbia School of Medicine. He was also the head of the hematology/medical oncology unit at Harry S. Truman Veterans’ Hospital in Columbia. Schilsky is also past chair of the Cancer and Leukemia Group B and a former member and chair of the Board of Scientific Advisors of the National Cancer Institute and of the Oncologic Drugs Advisory Committee of the Food and Drug Administration. Sugarbaker is the chief of the Peritoneal Surface Malignancy Program and the director of the Center for Gastrointestinal Malignancies at MedStar Washington Hospital Center. In 1989, he became the medical director of the Washington Cancer Institute at MedStar Washington Hospital Center. Currently, his clinical and investigative work is concentrated on the treatment of the peritoneal surface dissemination of cancer, known as peritoneal carcinomatosis. He has developed, perfected and popularized the combined treatments of cancer surgery with warm chemotherapy, infused into the open abdomen toward the end of surgical intervention. He has written over 900 articles and book chapters, edited seven books, produced 24 videos and received four honorary professorships. Von Hoff is the physician in chief and distinguished professor at the Translational Genomics Research Institute, chief scientific officer for US Oncology and a professor of medicine at the Mayo Clinic. He also holds the Virginia Piper Distinguished Chair for Innovative Cancer Research at HonorHealth Clinical Research Institute and medical director of research at McKesson Specialty Health. Discoveries by Von Hoff and his colleagues have led to tremendous improvements in survival for patients with pancreatic cancer, and they are currently concentrating on the development of molecularly targeted therapies for patients with pancreatic and other advanced cancers. Von Hoff has written more than 675 papers, 140 book chapters and over 1,170 abstracts. He received the 2010 David A. Karnofsky Memorial Award from ASCO for his outstanding contributions to cancer research that led to significant improvement in patient care. During the awards reception, Joseph R. Biden Jr., former U.S. vice president and founder of the Biden Cancer Initiative, was also presented with the 2018 Luminary Leadership Award for his cancer research and collaboration within the cancer community. 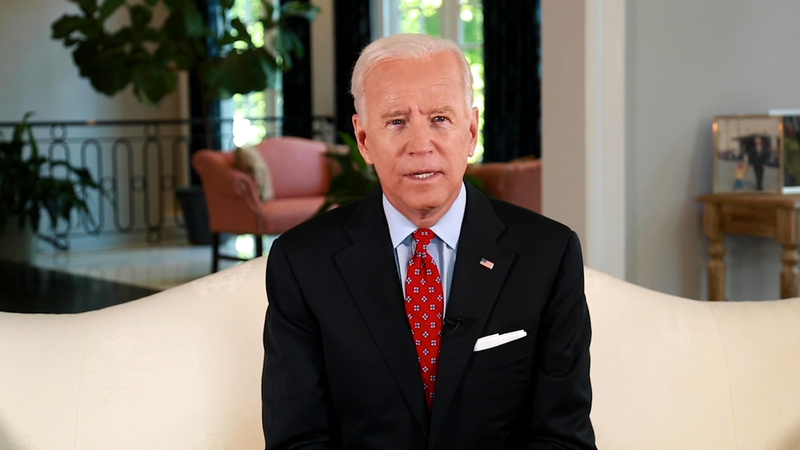 Gregory C. Simon, J.D., president of the Biden Cancer Initiative, made a special guest appearance and accepted the Luminary Leadership Award on behalf of Biden and shared with the audience a special video of the former vice president accepting the award. The Ruesch Center for the Cure of Gastrointestinal Cancers is part of the Georgetown Lombardi Comprehensive Cancer Center and focuses on personalized patient care and fighting against gastrointestinal cancers. The Ruesch Center provides the highest standard of care and individualized cures through clinical trials and research, education and advocacy, and regional and global alliances. For more information, please visit https://www.onclive.com/luminary-awards or follow OncLive® on Twitter and The Ruesch Center for the Cure of Gastrointestinal Cancers on Twitter.